Nintendo is to start selling a version of its home video game console in China, becoming the first of the big console makers to break into the Chinese market. Nintendo and its rivals Sony and Microsoft have steered clear of China until now because of the risk of product piracy. But Nintendo said it hopes "to see this market grow bigger than Japan, the United States or Europe." Nintendo also revealed it will cut the price of its GameCube home games console in the US, where sales have been flagging. 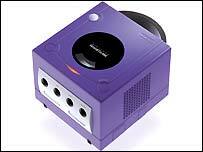 Nintendo, which faces stiff competition from Sony's PlayStation 2 and Microsoft's Xbox, halted production of the GameCube earlier this year because of a backlog of unsold stock. Nintendo said it would market GameCube for $99 in the US, a reduction of $50, in an attempt to boost sales in the run up to Christmas. "Under $100 is the magic price point for consoles, we believe," said Nintendo America's senior vice president of marketing George Harrison. The Japanese firm has devised a special version of its home games console for China to protect against piracy. Called the iQue Player, it will sell for 498 yuan ($60; £36). Each console will be sold with its own flash card to download software. The card cannot be used on any other iQue Player. Nintendo plans to release Chinese language versions of its Super Mario series about the adventures of an Italian plumber, and other top-selling titles. The Chinese online games market is expected to be worth $250m this year, Duncan Clark, who heads IT analysts BDA China, told BBC News Online. The absence of the major console-based games firms led the Chinese games market to develop around online games. "It is an anomaly that everything is PC-based" in China, said Mr Clark. Local companies like Shanghai-based Shanda and Nasdaq-listed Netease and Sina.com are racing to develop more titles. Multi-player virtual worlds are popular with Chinese gamers. Both Netease and Shanda have them, and Shanda last week said it had clocked up a record one million people playing simultaneously. However, Nintendo president, Satoru Iwata recently singled out multiplayer games for criticism, saying video games had got too complicated and Nintendo would spearhead a return to simpler formats. Home-use video game consoles have the potential to run online games but it was not immediately clear if Nintendo's iQue Player boxes would permit gamers to make the cross over. The iQue Player will go on sale in mid-October. China has tightened both its intellectual property laws and their enforcement since it joined the World Trade Organisation in January 2002. But enforcement of anti-piracy laws in online games and music remains notoriously difficult worldwide. BBCi - Where next for Nintendo?